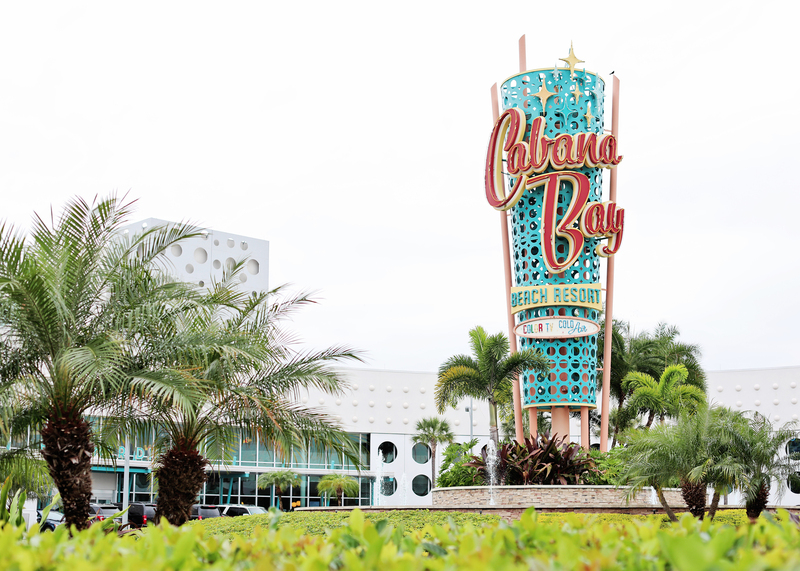 As soon as we drove up to the Cabana Bay Beach Resort, I fell in love with the retro-themed property! 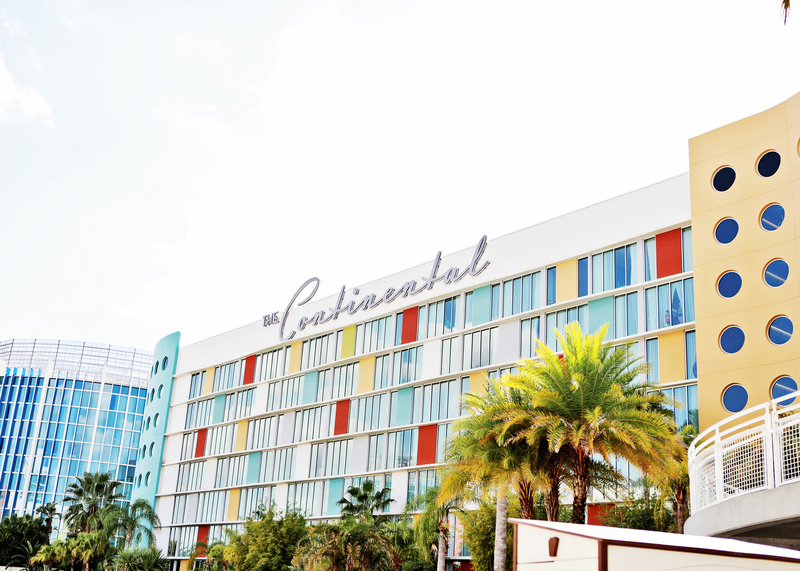 It felt like we’d stepped back in time as we took in the iconic architecture inspired by classic Florida beach resorts of the 1950s and 60s. Last month we spent a few days at Universal Orlando over spring break, and the Cabana Bay Beach Resort was our home base during our trip. Anderson and I hadn’t been to Universal in years, and we’d never taken Kingston, so we were excited to experience all the fun through his eyes! Our time at the resort and theme parks did not disappoint! The hotel’s retro colors, patterns, and design are basically my dream come true! And to my delight, the theme is brilliantly carried throughout the property, including the guest rooms and suites. Everything down to the tiniest detail is nostalgic – the toiletries included Zest soap and V05 shampoo and “creme rinse!” And we passed Marilyn Monroe as we walked through the lobby a few times! We enjoyed so many of the hotel’s amenities, including the two oversized pools surrounded by plenty of lounge chairs and cabanas, a lazy river and water slide, an arcade, Starbucks near the lobby, an old fashioned diner, a restaurant inside a bowling alley, on-site pizza delivery, and transportation (and early admission!) to all 3 Universal Orlando theme parks! The next day we took a shuttle straight from our hotel to Universal Studios Florida and dodged evil villains, defended the earth, faced a fire-breathing dragon, and wandered into animated worlds where characters we love were suddenly right beside us! Our favorite adventures at this park were Jimmy Fallon’s Race Through New York (of course!) and Despicable Me: Minion Mayhem. Why are those minions so cute?! We enjoyed both theme parks and discovered the secret to getting the most out of the Universal parks: the 2-Park Universal Express Unlimited™ Pass. During a full two days at the parks, we only waited in one line longer than 20 minutes! And most attractions didn’t have any wait at all in the express pass lines. The express pass was an add-on to our 2-day, 3-park tickets, but waiting in lines at theme parks is at the very bottom of the list of things I enjoy. Very, very bottom, so not having to do that made our trip so much more fun! It also meant we didn’t have to spend 12 hours at the park to fit in all the attractions. Worth it!!! While the parks are fun and entertaining, if you just need a little relaxing weekend getaway, Cabana Bay Beach Resort is the perfect spot for that. There’s enough to keep you entertained even if you don’t want to do a theme park adventure! And if you happen to be a fellow Florida resident, check out their special rates just for us locals.